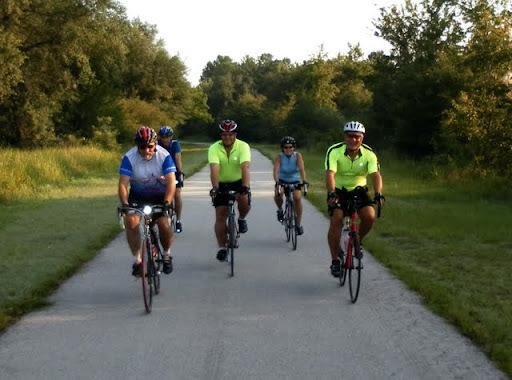 The Withlacoochee State Trail is part of the Rails to Trails program, a nationwide string of old railroads that have been landscaped and paved and converted for bicycling, rollerblading, hiking, and horseback riding. Many, including this trail, have modern rest areas with covered picnic areas, fresh water, and clean restrooms. The Withlacoochee also works its way through a series of small towns along the way, adding to the charm. 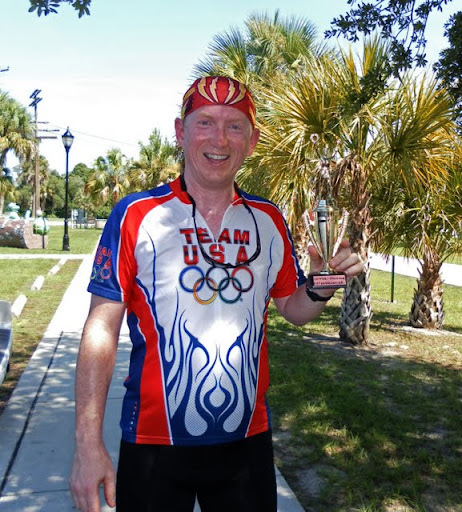 Inverness, FL is about 2/3 of the way along the 46 mile trail and has terrific facilities. 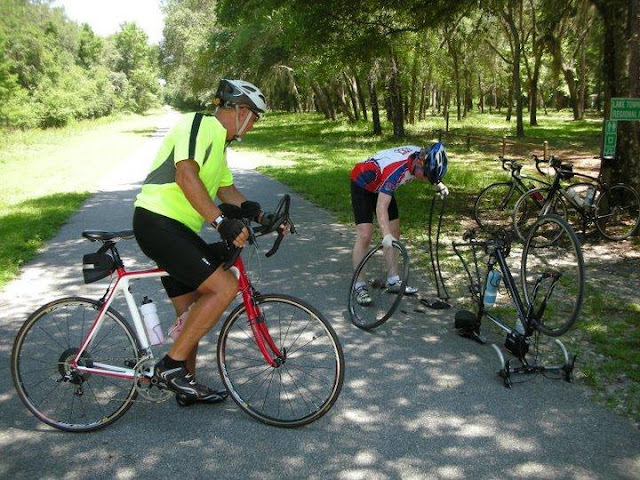 The Inverness Trailhead has plenty of parking, clean restrooms, a bike shop, and a restaurant. How much more could you ask for? The forecast was for a hot day. To make the most of the cooler hours, we decided to meet at the Inverness Trailhead and plan to be "wheels up", on the move at 6:30 am. That was a few minutes before sunup but light enough to see what we're doing. It was 74 degrees. Our intrepid group before we head out. We headed north toward the north terminus at a comfortable cruising speed of 17 mph. There was a rest stop along the way but we decided to press on to the end of the trail, 16 miles from the starting point, and make that our first stop. Along the way we saw, but didn't get a chance to photograph, a medium-sized female deer that stood right next to the path as we passed by. At first, I thought these were huge spider webs. Turns out they are spun by worms. They hibernate inside until the emerge as moths. There were hundreds of there all along the trail. Over the shoulder shot of our group. The northern segment of the Withlacoochee Trail is gorgeous. Much of it is covered in canopies of trees with beautiful views and even some very nice houses. Right on time, we returned to Inverness with 32 miles under out belts and it was only 9:00 am. We made our way to the Two Sisters Parkside Restaurant, right next to the trail, where Chuck's wife had been kind enough to secure tables for our group. The Two Sisters is used to seeing cyclists so they didn't bat an eye at our sweatiness or our road shoes. They even have racks for parking your bike while you're inside and their prices and service are decent. At breakfast at the Two Sisters Parkside restaurant. We were only 1/3 of the way done so after breakfast we headed south toward Floral City and, eventually Trilby at the southern terminus. A few short minutes after resuming the ride, the guys in the back of the pack called out that I should come back and take a photo. We were passing a particularly pretty park so I looked to the left and thought, "Yeah, that's nice." Then they called out, "NO! You have to come back HERE to take it!" Okay. I slowed and made a loop and dropped in behind them. ...and immediately started laughing so hard I almost feel off the bike!!!! Carrie swore it wouldn't fall out but it did at the next intersection. Being a good husband, John rode back and retrieved it for her. The ride from Inverness to Floral City is equally beautiful and tree-lined. There is also another nice rest stop in Floral City with bike racks, covered benches in a gazebo, restrooms, and another bike shop across the street. Not far after Floral City, we saw another momma deer and two babies cross our path so quickly that there was no time to whip out the camera. We also saw a large brown bird above the trail but it was way too far away to ID. The last rest stop with facilities is the Ridge Manor Trailhead. We noticed that the southern portion of the trail had considerably less tree coverage than on the northern half. It was getting warmer so we decided to stop at every rest area just to be safe. Our last rest stop on the southbound leg of the trip. It was after this that things got kind of interesting. Dwight had a flat tire. We stopped to fix it, wisely moving into the shade of a tree to do so. Less than two miles later, the same tire was flat again. Another stop, another fix. Dwight had it under control and insisted that we ride on to the terminus, less than two miles ahead, and return for him so we could at least say we rode the entire route. That was big of him so we did. When we returned, he had the tire fixed and was ready to go. Less than two miles later... yep, same tire. At that point, Dwight walked his bike to the Ridge Manor Trailhead and decided to wait there. He had facilities there and was around other people so we felt he would be safe. Chuck took Dwight's keys and promised to return to pick him up after we got back to Inverness. 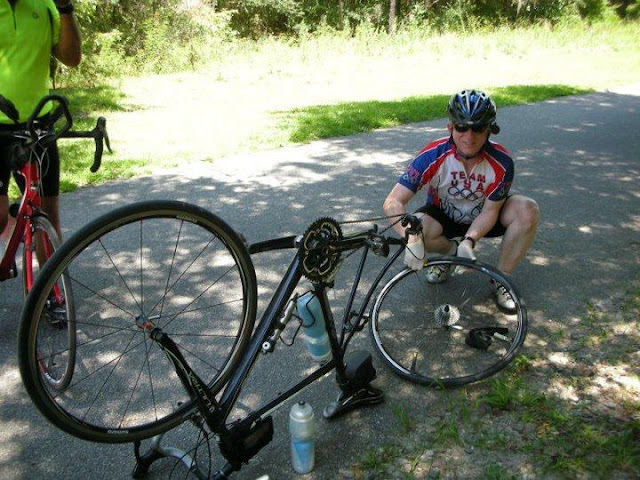 Less than ten miles later, I had a flat. :-/ In my case, the cause was pretty obvious. A while back, I picked up a large piece of glass in the rear tire. I had put two pieces of duct tape inside the tire to prevent the tube from squeezing out through that hole and causing another flat. It worked... for a while. As soon as we removed the tube, we could see a hole had worn through both layers of duct tape. Wow! That's tough stuff. I swapped tubes and we were underway a few minutes later. Me fixing a tire. Photo by Dennis Blackburn. Yes... I pack surgical gloves so I can change a tire and then finish the ride without greasy, dirty hands. Photo by Dennis Blackburn. Close supervision. Photo by Dennis Blackburn. 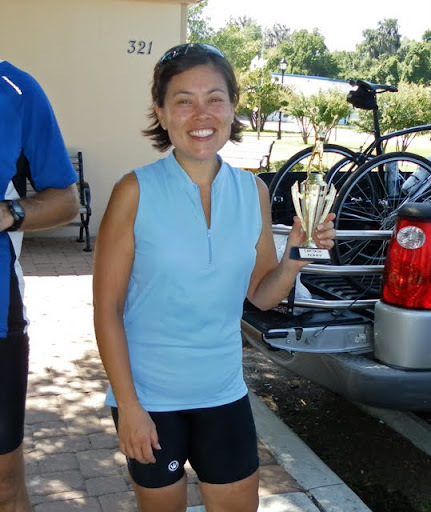 Carrie was awarded the Captain Perky trophy. Chuck volunteered to ride on ahead, get Dwight's truck, and return to pick him up. 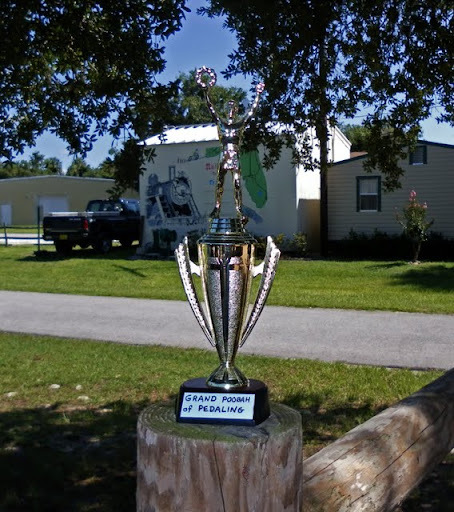 In his absence, and for his extra effort at riding on ahead, he was awarded the Grand Poobah of Pedaling trophy. We had a blast! We rode a total of 92.8 miles, the longest ride ever for Chuck, John and Carrie. The temp when we finished was 94 degrees. 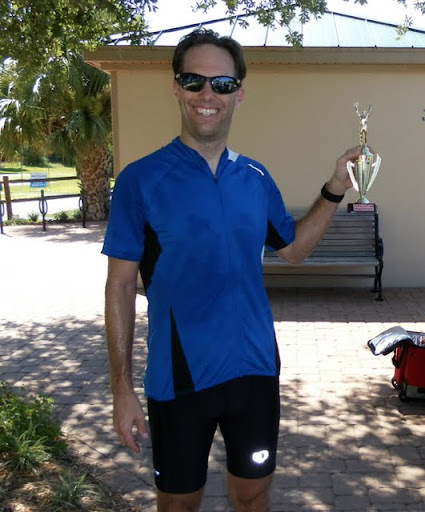 Over the course of the six and a half hours of saddle time, I burned 4210 calories. We averaged 14.0 miles per hour but that included lots of stops and I hit a maximum of 24.3 mph playing catch up to the group after taking a photo. Thanks to Dennis, Dwight, Chuck, John and Carrie for coming along and making it such a fun day. Site contents may not be reproduced in any form without express consent.